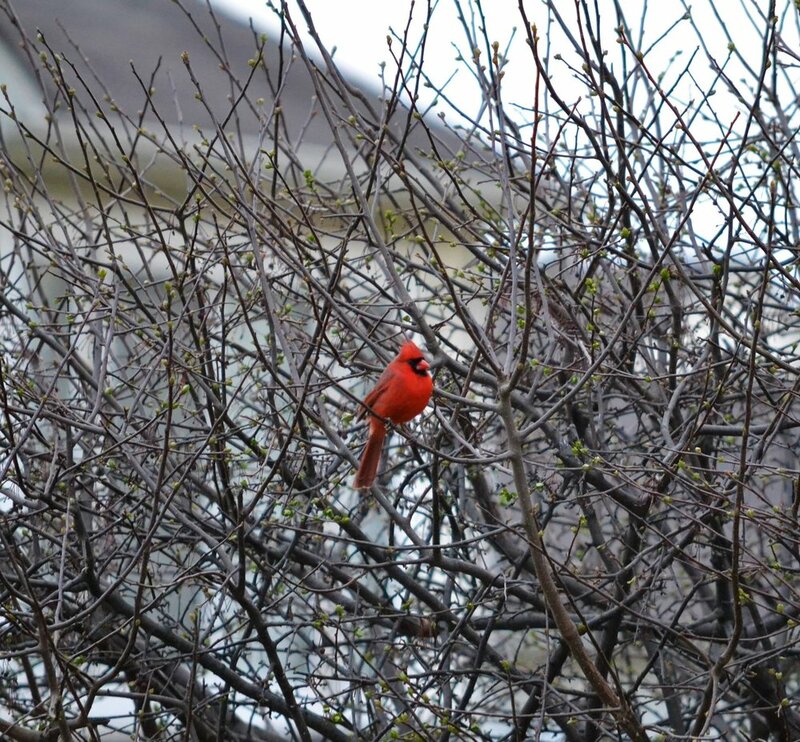 Avery's Cardinal sits in his favorite tree, welcoming the start of the tiny Spring blooms. 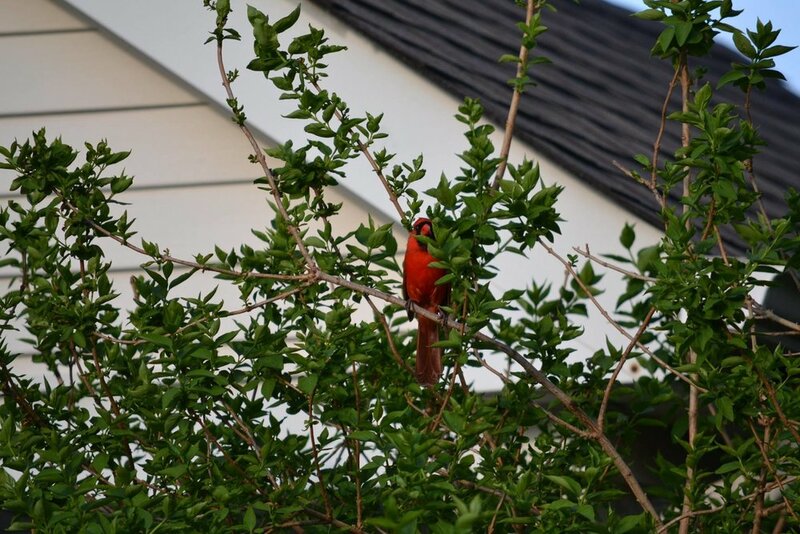 His songs are intoxicating in the Spring, as he finds the peak of our roof and the tops of nearby trees to look for "Mrs. Cardinal". The Summer is always filled with amazing sightings of my little angel. He peeks through trees and often finds me waiting. I think the legends are true, and cardinal angels are instinctual to know exactly when you need to be comforted. In the Winter, Avery's Cardinal packs on a few pounds for the cold months ahead. He will puff out his feathers to properly insulate and keep warm. 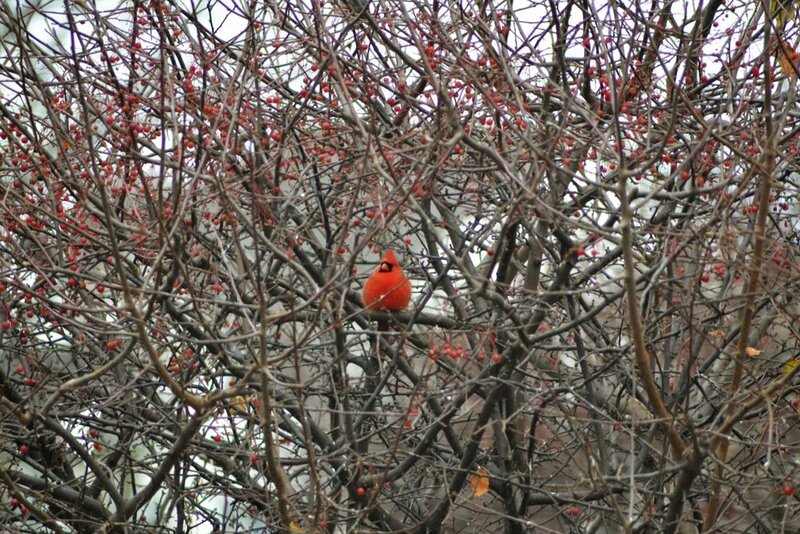 Here, he visits in his favorite tree surrounded by little red berries. It was June 2016, only days since we said good-bye to our first and only son. My husband and I sat, still in shock, on our deck. I was crying and trying my best to sip the coffee that sat warming the insides of my hands. I didn't have much of an appetite, but coffee seemed to soothe my soul just enough to calm my waves of grief temporarily. All of a sudden, out of the corner of my eye I saw something beside me on the fence. When I looked over, it was a bright red cardinal. I froze, motioning to my husband..."I can't believe this" I muttered over to him. He gazed over at this little red beacon of promise and smiled. Before I could say anything else he asked me "Don't cardinals have some sort of meaning behind them." I was so eager to explain what I knew. "Absolutely! Cardinals mean there is an angel visiting! It's Avery!" What happened over the next several weeks was something of a miracle. The cardinal was making our home his home. I can remember being woken up at early hours of the morning, the darkness still lurking outside our windows and would hear the calls of the cardinal. The sweetest song I had ever heard. I thought once to myself, is this my baby's way of waking me up in the middle of the night? No, it's not for a bottle, nor will it ever be, but I am waking up to the song of my guardian angel. The cardinal was everywhere we went. But better yet, he was at our home...and there was no way he was leaving. Sighting after sighting continued to happen. My husband and I visited Anderson Japanese Garden. It is about an hour and a half away from our home. We got to our destination and I opened the car door to hear a cardinal singing. We went inside, bought our tickets and opened a glass door to start our walk in the gardens. I turned to my husband and smiled as he smiled back because we were both hearing the same sound again. I took a few steps onto the gravel trail, looked up and there he was. My cardinal angel appearing. It was the perfect welcome that I needed to help my hurting heart. It hit me hard, as that day was International Bereaved Mothers Day, but I grabbed Avery's pendant with tears starting to form and was thankful for our sign. My son was with us, to spend the afternoon in the sun and serenity of the landscapes. Walking around Lake Katherine on a beautiful sunny day, I was given a day of inspiration and love. As the final draft of the next volume of Avery's Garden Coloring Book Series: With Wings They Fly was submitted, I ventured off into nature. I was surrounded by dragonflies all day, and rejoiced in the thoughts of it being the angels I helped honor in the series. Several dragonflies made it into the next book, you see, so naturally I thought it was their loving way of saying "thank you". It was a day of adventure and encounters from even a butterfly, frogs and many birds. I sat on a bench privately tucked away with a view of some of the bright simmering waters. I thought to myself, the only thing that could make this day better would be to see a sign from my baby. At that moment, a cardinal landed on a tree branch in front of me, so close I could almost touch him. He stared right at me, instantly making me freeze in shock and the tears start rolling down my cheeks. He knew, and some how Avery sent me my sign. We played tag for a few minutes as he strutted in front of my feet as if ready for his photo shoot. Snap, snap, snap....with each picture smiling and wiping away my murky eyes. He disappeared and I was sad that our game had ended. I went across the trail and sat at a new bench spot, sighing and saying out loud this time "where did you go, you stinker". I looked down and there he was again, tucked into some sticks and unpruned bushes. I smiled, snapped his final picture and he flew away. 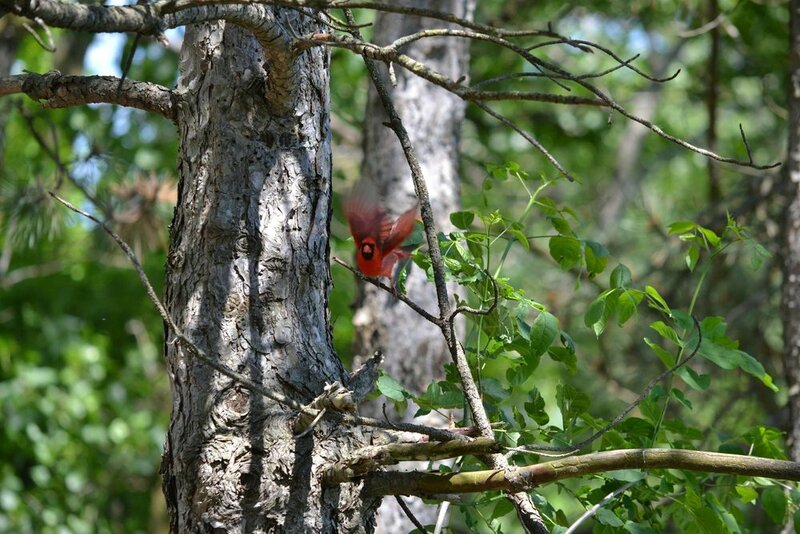 I am thankful for that experience, as every encounter I have with the beautiful red cardinal. I have no doubt it is Avery, telling me that he is still very close and has no intentions on leaving my side. It was 16 days until his 1st angel-versary.